Gary Wolter the Assistant Presiding Bishop of the Jesus Christ Apostolic Ministries International, was born February 12th 1971, in Racine, Wisconsin. Grew up in a Catholic and Lutheran Family. Attended a Pentecostal Church with a friend in middle school, and held the True Gospel ever since. Received the Holy Ghost and was Baptized in the Name of Jesus in 1990 in Anniston, Alabama. Received the call into Ministry a few months later. 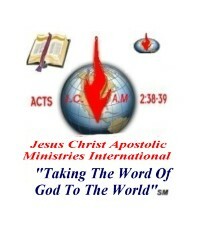 Was Licensed by the AWCM in 1992 and was Ordained by the AWCM in 1995. Was Ordained as a Minister in 2005 by the CSM and was Ordained as Bishop on December 3rd, 2005 with the Jesus Christ Apostolic Ministries. Currently serving as Presiding Bishop of the JCAMI overseas Diocese and the 2nd Assistant Presiding Bishop for the JCAMI. Bishop Wolter is married to Sister Kyong Wolter and they have one Daughter who is now 14 years old. Bishop Wolter’s goal is to spread the Good News and plant Churches and Ministries in Asia.